Expect at least 4 hours, perhaps longer for cleaning and painting parts. It is fairly easy to replace a lower seal on a Burman steering box. The steering box does not need to come out of the car. 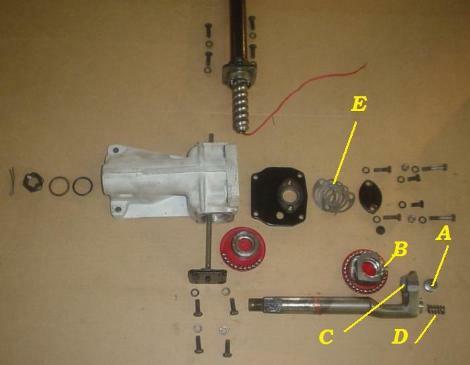 The Burman steering box is stunningly simple, very robust, and has very few moving parts. Before starting, read this entire procedure and understand it, including the nomenclature of parts. Reference you repair manuals for exploded diagrams or this link. 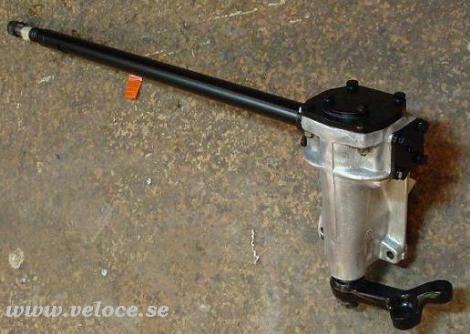 Below, a steering box for the US market. They have a different column but the box has the same construction as the other Burmans. 1.32mm socket for removing the lower bolt from the rocker shaft. If you don't have a 32mm, a 1¼" socket works just as well and is within a quarter millimeter of 32mm. 2.Sturdy breaker bar, preferably at least 1/2" drive with extension. Photos by OssodiSeppia and www.duettoinfo.com Brian has an utterly clean Duetto. 1.The night before you do the work, I would recommend that you put some high quality penetrating oil on the upper part of the steering drop arm and rocker shaft. It is likely that these parts are corroded together somewhat and will be difficult to separate. 2.Put car securely up on jackstands. You will be exerting considerable force getting therocker shaft nut loose and again torqueing it to specification, so the car need to be rock stable. 3.Recommend removing the exhaust downpipes and front resonator for more working room. 5.Mark steering drop arm to index it with the rocker shaft. You want to reinstall the drop arm in the same relative position to the shaft. 7.Use the 32mm (1 1/4") socket and breaker bar to loosen the rocker shaft bolt. Remove it completely and clean the threads. 8.Loosely replace the bolt on the end of the shaft so that the steering drop arm won't come flying off the shaft should it pop under tension. This bolt is torqued to about 100 ft/lbs, so it'll be fairly hard to turn. Lock the steering wheel so it won't turn. 9.Use the 2 arm gear puller to extract the drop arm off the rocker shaft splines. This will likely require considerable force on the part of the puller. It must be of high quality. 11.If the drop arm won't budge, give the end of the puller screw a sharp hit to break the corrosion. Be prepared for a #pop#. If it still won't budge, put some more penetrating oil on it and leave it under tension with the gear puller overnight and try again in the morning. 12.Remove the bolt and extract the drop arm from the shaft. 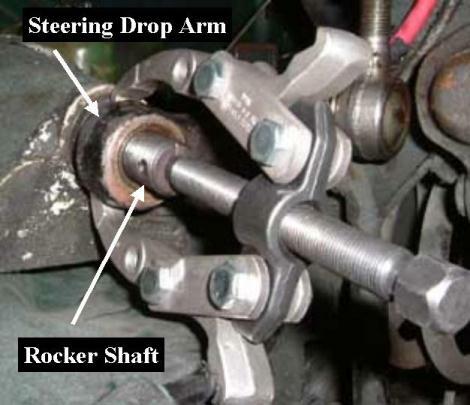 There is no need to disconnect the tie rod ends from the steering drop arm. 13.You may have to turn the wheels slightly to the right to have the end of the drop arm clear the left suspension. This isn't a problem because you've already marked the shaft and drop arm to their relative positions. 14.Take hold of the shaft and see if you can feel any lateral play (wear) in the bushing. If so, the box may need a new bushing reamed. 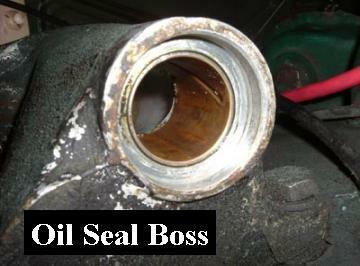 Replacing a seal in a shaft with worn bushings will probably leak again. 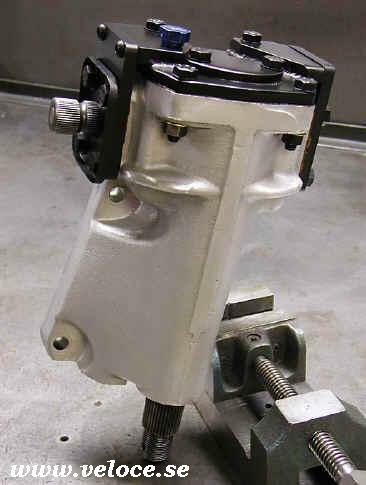 15.If the steering box still has oil in it, place a bucket under the steering box. 16.Working in the engine compartment now, remove the small oval cover on the top of the steering box. This cover is under slight tension from a short spring underneath. Remove the cover along with the shims underneath. 17.Remove the entire top plate of the steering box. The left side bolts are in blind holes, and the right side bolts have nuts and lock-washers underneath. The top cover isnot under tension and will just lift off. 18.The inside of the steering box is now revealed. Note and mark the position of the rocker shaft in the box. You will want to return it to this position again for reinstalling the drop arm later. 19.Next, turn the steering wheel so the rocker shaft is at the FRONT of the box, i.e. with the wheels pointing fully to the left. 20.Pull up on the rocker shaft and remove from the steering box. It may take a bit of twisting and slight rotation to extract the shaft, but it will come out. 21.The main nut roller will likely be dislodged when you do this so be prepared to capture it before it falls into the lower part of the box. Stuffing some small rags or paper towels will help capture it. If it does fall down into the box, it should be easy to retrieve. 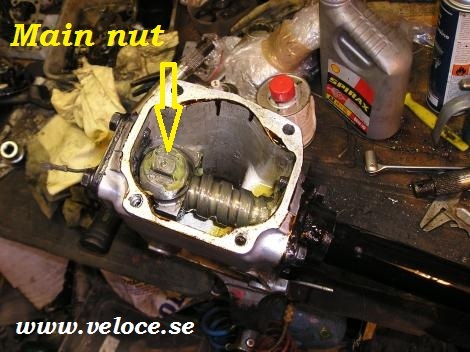 22.With the rocker shaft out of the box, get back underneath the car and pry out the old oil seal. An ordinary screwdriver or purpose built seal extractor both work well. 23.Clean out the cavity. Inspect the bronze bushing in the steering box body for wear or damage. Ensure that the bottom of the bushing is flush with the bottom of the boss. If not carefully tap it back up into place. 24.Hopefully the steering box is clean inside. If not, it's wise to clean it out while the lower seal is out. Inspect the case casting for any cracks. I'll be easiest to see them from inside the box. Look especially closely at the rear of the box where the steering shaft enters. 26.Install the new seal. Hand fit it square into the boss, then squarely tap it into place. The flat end of the 32mm socket works well. Just insert the extension bar backwards in socket and tap the seal into place. 27.Clean and inspect the rocker shaft. There might me some corrosion right around where the lower oil seal contacts the shaft. Clean well and polish with a little metal polish so the surface is as smooth as practical. 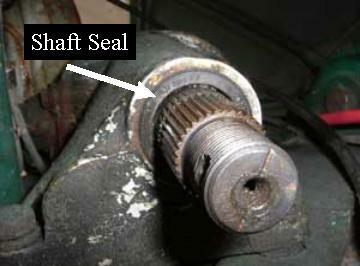 28.If it's badly corroded, you may get a leak even with a new seal. A good machine shop can likely fix a corroded shaft either with machining or installing a sleeve. If this is the case, you might need to get another seal with a different inside diameter size. 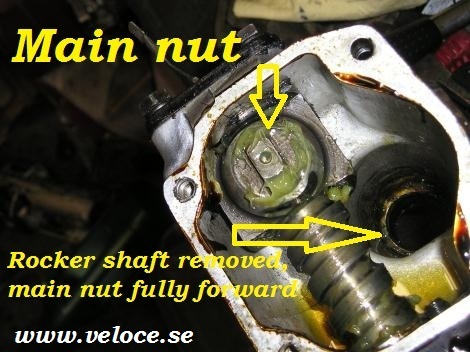 1.Grease the rocker shaft in the area where it contacts the bushing and lower seal lip. Carefully lower the shaft back into the box body. Line up the steering nut and hole in the upper shaft arm. Grease and replace the main nut roller in the hole in the upper shaft arm. 2.Turn the steering wheel back to line up the rocker shaft to the original index marks you made in the top of the box. This will put the steering box back in the same position as when you removed the drop arm below. 3.Replace the top cover. Cut a new gasket if necessary. Torque bolts to 16.6 to 18 ft/lbs. 4.Replace the small oval cover along with the shims and the short spring. To start the bolts, you may have to push down on the cover slightly. This is the key to the play. 5.The spring (D on the photo below) should press down the shaft (C on the photo below) so that there is no play at all. The shaft pressure effects the round "cup" #6 (A on the photo below) on the drawing here. The shims are #8 (E on the photo below). The parts A and C are somewhat conical and the springs takes the play. Here's a photo. 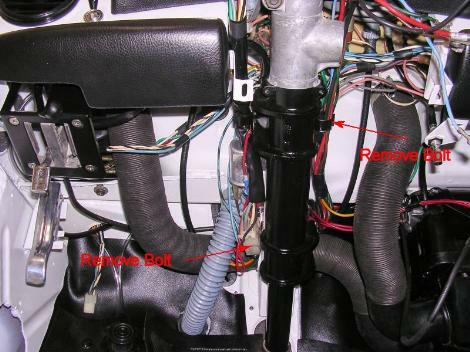 6.Refill the steering box with a little 90w GL-5 gear oil and check for leaks at the bottom. If no leaks, refill the box. 7.Replace the filler plug. If your filler plug is missing, get one. Any local auto store should have one that can be made to fit. 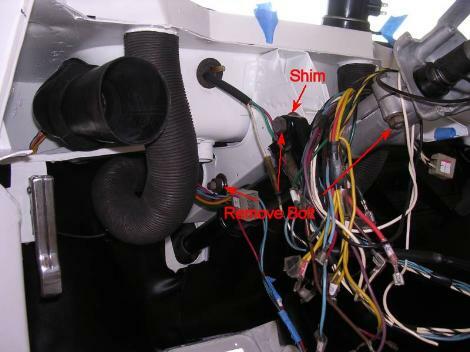 Do not leave it open or the steering box will become contaminated with dirt and moisture. 8.Back underneath the car, replace the drop arm being careful to line up your previously made index marks. Using some anti-seize compound will make it easier to remove, if necessary, in the future. Reinstall the large castiliated nut. 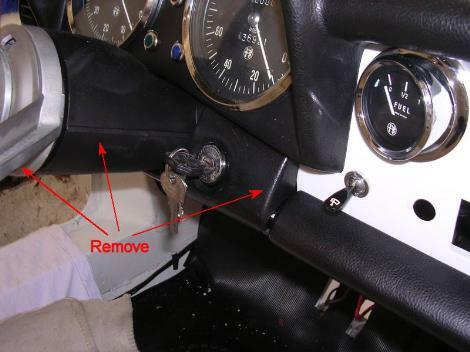 9.Before torqueing, place a chunk of wood between the drop arm and the left steering stop. This will take the torque of the tightening process instead of transferring it to the steering mechanism. Torque to 90.4 101.2 ft/lbs. 10.At the same time, line up the holes for the cotter pin. It is necessary to use a new cotter pin unless the old one is in excellent condition. As all steering parts, this is a safety item. 11.Turn steering wheel stop to stop and check for normal operation and then check to ensure that you're able to turn the wheel so that the steering linkages under the car hit both the right and left steering stops without reaching the internal steering box limits. 12.There should be no need to realign the front end of the car since no steering geometry was changed. 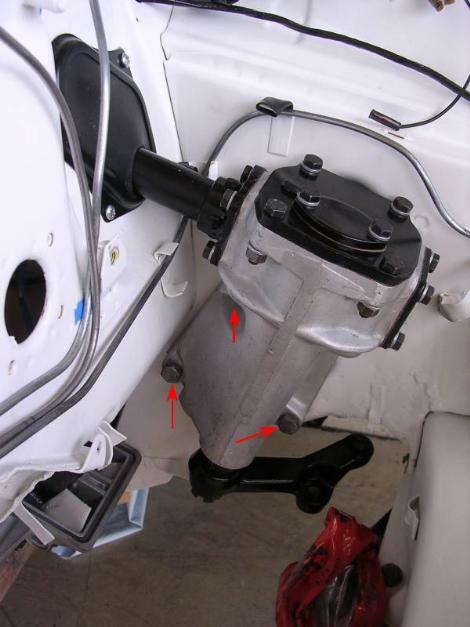 13.As an ancillary item, check the tightness of the steering box to chassis bolts. 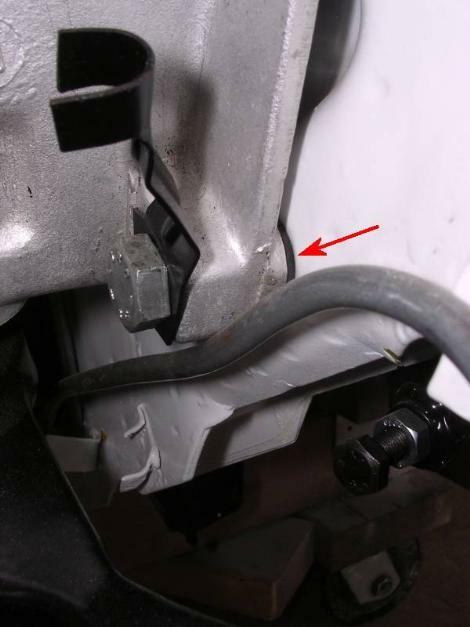 Also check for any sheetmetal cracks where the steering box attaches to the body.